Treatment had barely begun in mom's case when we started hearing that she had a low blood count. Well, that sounded ominous. Just what did low blood counts have to do with her pancreatic cancer? Actually, quite a lot as it turns out. Blood draws, blood panels, and blood reports have all become second nature to us by now. They are a very crucial measuring stick for the oncologist in deciding how the cancer treatment is proceding and how the patient is handling it. But, in the beginning it was like learning a foreign language. I am no hematologist, that's a doctor who specializes in diseases of the blood, but if you would allow me, I'd like to share what we've learned along the way, a rather basic primer on Blood Counts in general and Low Blood Counts in particular. Please remember, always seek the counsel and advice of your own medical team if low blood counts are a side effect of your own cancer treatment. Your blood cells play a very important role in each system and function of your body. It's no-brainer that blood is our life force. Without it, well, we wouldn't be worried about anything, much less how to beat pancreatic cancer. That's the first absolute. Your blood cells are vitally important! Now, it starts getting a bit more complicated. There are 3 main types of blood cells: red blood cells, white blood cells and platelets. Red blood cells primarily transport life-sustaining oxygen to cells throughout the body. White blood cells primarily deal with your immune system's ability to fight off infection and disease. Platelets help the blood clot to keep you from bleeding to death. Are you starting to see why your blood cells are so vitally important?! And why a low blood count could be of huge concern to your doctor? So, the obvious next question is why. 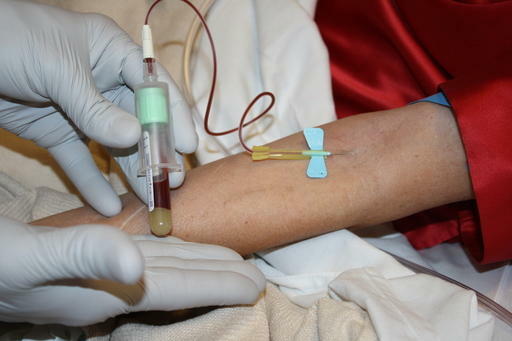 Why do cancer patients develop a low blood count? And there are many complicated answers to that question, but the simple answer is that the treatments can inhibit blood cell production. And this is a basic explanation: Scientists have learned that cancer happens when cells in your body go haywire and start multiplying too rapidly. They become quickly-dividing cells, get out of hand and form tumors, what we know as cancer. Many chemotherapy drugs and some specific radiation, attack the cancer by targeting any quickly dividing cells, of which cancer is. The treatment stops the cell division and ultimately (prayerfully) stops the cancer from growing. Now, where do blood cells fit into this scenerio? Well, blood cells are made in your bone marrow, that's the spongy tissue that fills the center of your bones. And these blood cells in your bone marrow are also quickly dividing cells. The chemotherapy and radiation can’t tell the difference between the cancer cells and the blood cells, and so they stop the blood cells from dividing as well. And that's what can lead to a Low Blood Count. Starting to make sense? Your doctor will be monitoring your blood counts carefully while you are undergoing treatment. Mom gets a blood test, or a blood draw at every doctor visit and definitely before each and every chemotherapy treatment. As a cancer patient, you have a right to see each blood count lab report. Mom always asks for a printed copy when she has blood drawn, and the techs are happy to oblige. The doctors are pretty good about explaining the low blood count - if you ask them. Often they just nod and make a decision on whether to continue treatment that week or not. As a savvy cancer patient, you deserve to know where you stand and how your blood counts stack up week to week. 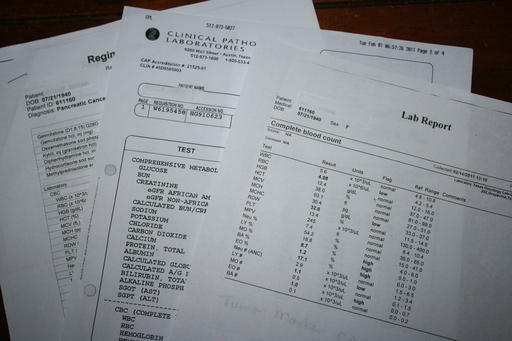 That brings us to a whole other complicated topic: The Blood Count Lab Report. 1)	WBC (White Blood Cell Count) – White blood cells fight infection. There are actually five different types of white blood cells. This count just gives the total value of all white blood cells. 2)	RBC (Red Blood Cell Count) - Red blood cells carry oxygen to the body’s tissues and remove waste products from the body’s tissues. Red Blood Cells contain hemoglobin. 3)	HGB (Hemoglobin) - Hemoglobin carries oxygen to the body’s tissues and carries carbon dioxide (waste) away from the body’s tissues. Hemoglobin also gives Red Blood Cells their color. 4)	HCT (Hematocrit) – the Hematocrit is the percentage of red blood cells in relation to your total blood volume. 5)	PLT (Platelet Count) – Platelets help you to stop bleeding by forming clots. There is one other measurement you may hear your doctor use. It is your ANC number. ANC stands for absolute neutrophil count. A neutrophil is one of the 5 types of white blood cells. The ANC basically measures the number of infection-fighting white blood cells in your body . There is a somewhat complicated formula for figuring out your ANC, but it helps determine how susceptible you are to infection. A normal ANC is greater than 15. If yours is lower than 5, your risk of infection goes up significantly. If you experience any of these symptoms while undergoing cancer treatment, contact your medical team immediately. Mom has dealt with all the above side effects due to low blood counts. She's had treatment postphoned until her counts come up, she's had blood transfusions when they didn't. Monitoring her blood counts is just a fact of life now, a part of the pancreatic cancer journey. And we like to party when her Blood Counts behave and fall in the normal range. It really is a Life Force kind of celebration!